This method will allow for creating a vision for the region by gathering views from all stakeholders through a set of structured questions about the future. The method can integrate a link to iKnow platform (outcome of FP7 project on foresight http://wiwe.iknowfutures.eu/iknow-description/), which aims at interconnecting knowledge on issues and developments potentially shaking or shaping the future of science, technology and innovation (STI) in Europe and the world. Regions: CY, HR, NL (Noord-Holland), NL (Zuid-Holland), PL (Warmińsko-Mazurskie), SI, FI (Lapland), SE (East Sweden), SE (Stockholm). Regions: CY, HR, NL (Noord-Holland), NL (Zuid-Holland), PL (Warmińsko-Mazurskie), SI, SE (East Sweden), SE (Stockholm). Regions: CY, DE (Niedersaschsen), HR, NL (Noord-Holland), NL (Zuid-Holland), PL (Warmińsko-Mazurskie), SI. Regions: HR, NL (Noord-Holland), NL (Zuid-Holland), PL (Warmińsko-Mazurskie), SI, FI (Laplanfd). Regions: CY, NL (Noord-Holland), SI. Regions: AT, CY, DE (Bayern), DE (Niedersaschsen), EL (Central Macedonia), EL (Eastern Macedonia), ES (Andalucia), FR (Aquitaine), FR (Mid-Pyrenees), HR, IE, IT (Emilia- Romagna), LT, LV, NL (Noord-Holland), NL (Zuid-Holland), PL (Warmińsko-Mazurskie), PT (Centro), SI, SK, SE (East Sweden), SE (Stockholm), UK (Northern Ireland). Regions: AT, CY, DE (Bayern), DE (Niedersaschsen), EL (Eastern Macedonia), ES (Andalucia), FR (Mid-Pyrenees), HR, IE, IT (Emilia- Romagna), LT, LV, NL (Noord-Holland), NL (Zuid-Holland), PL (Warmińsko-Mazurskie), PT (Centro), SI, SK, UK (Northern Ireland). Regions: AT, DE (Bayern), DE (Niedersaschsen), EL (Eastern Macedonia), ES (Andalucia), FR (Mid-Pyrenees), HR, IE, IT (Emilia- Romagna), LT, LV, NL (Noord-Holland), NL (Zuid-Holland), PL (Warmińsko-Mazurskie), PT (Centro), SI, SK, UK (Northern Ireland). Regions: AT, DE (Bayern), DE (Niedersaschsen), EL (Eastern Macedonia), ES (Andalucia), FR (Aquitaine), FR (Mid-Pyrenees), IE, IT (Emilia- Romagna), NL (Noord-Holland), PT (Centro), SI, SK, UK (Northern Ireland). Regions: EE (tbc), ES (Andalucia), IE, IT (Emilia- Romagna), LT, NL (Noord-Holland), PL (Warmińsko-Mazurskie). Regions: AT, EE (tbc), IT (Emilia- Romagna), IT (Puglia), LT, NL (Zuid-Holland), PL (Warmińsko-Mazurskie). The mapping exercise found that Noord-Holland in the Netherlands (incorporating the provinces of Drenthe, Fryslân and Groningen) undertook the majority of these “collaborative vision building” techniques. Noord-Holland carried out all the methods except ‘Foresight’ and ‘Delphi Survey’. The Noord-Holland region is categorised as ‘Strong’ in the RIS ranking. John et al. (2015) describe visioning as the “process of constructing desirable future states”. In expanding upon this definition, they suggest “The current state of the art converges on a visioning practice that accounts for systemic relationships, ensures coherence and adopts advanced sustainability concepts, while allowing all relevant stakeholders to provide inputs. Incorporating such visioning practice into regular planning processes allows city administrations to avoid conflicting and suboptimal development, unintended consequences of development with adverse impacts, and stakeholder resistance due to lack of ownership and accountability”. The visioning process should develop a shared and compelling vision on the economic development potential of the region and the main direction for its international positioning. The visioning process should mobilise power. It should attract stakeholders to participate in a process in which they feel they can add value to and also benefit themselves. Visions are often most effective when directed by a ‘grand figure’ such as a politician, industrialist, leading academic who can help promote the process on a larger scale. Visions are often generated during times of crisis, when the need is most acute. Visions should be ambitious but remain credible. Over-ambitious visions will undermine the RIS3 and fail to connect with stakeholders. There should be a willingness to reach a consensus and work towards the transformation. The vision should be bold, with realistic priorities and specific development paths. The vision should identify possible paths for the economic renewal and transformation of the region. The vision should also include justifications for its relevance in terms of meeting societal challenges. Participation is key to the collaborative visioning process. Arnsteins (1967) seminal work identified different levels of participation using the analogy of rungs on a ladder. 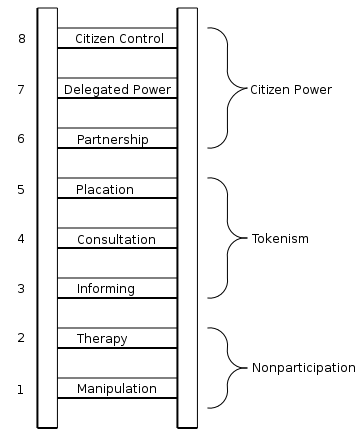 Arnstein identified 8 levels of participation, ranging from manipulation to citizen control. 1. Visioning is a new and innovative technique. How new and which aspect of visioning is supposed to be new? What is novel and original in participation, long-term strategic thinking, and the creation of motivational images? 2. A clear image or vision of the future acts as a beacon to guide actions until that vision is reached. Is it always possible and necessary to have a visual image of the future? Is our need to know where we’re going always strong? 3. If you have a clear vision you will be inexorably drawn towards it. The accounts of success with visioning and the claim that a vision will act as magnet pulling you towards it are tautological. There is no clue of what a good vision is in advance because one may say ex post that it was a good vision if it works or it wasn’t a good enough vision if it doesn’t work. 4. The clearer the picture of the future, the better it will be as a guide. When a whole community is involved in a goal setting and visioning exercise, clarifying collective goals is not an easy task. 5. A clear image of the future will inspire and motivate purposeful action. How motivational can a vision statement really be? In actual practice, vision statements may have little impact on decision making. 6. A strong, shared community vision is possible to articulate. Efforts to create a shared community vision face the physical and social complexity inherent in community planning. Who really participates in creating a shared community vision? 7. The more people are involved in creating a vision the more they will accept it and be motivated by it. There is little evidence that participating in goal setting strengthens commitment to achieving the goals. 8. The broader the involvement in creating vision goals the more effective those goals will be in bringing about social harmony and well-being. In reality, broader involvement does not mean active participation of all isolated communities. 9. People who might not otherwise be included in planning will be involved in visioning. Those who take part in visioning do not necessarily represent the diverse segments not usually represented as participants in planning. Participatory visioning cannot be a process for direct democracy because it requires a minimum level of knowledge and commitment. The ability to create future images is not universal. Not all people are motivated by concepts of future states. 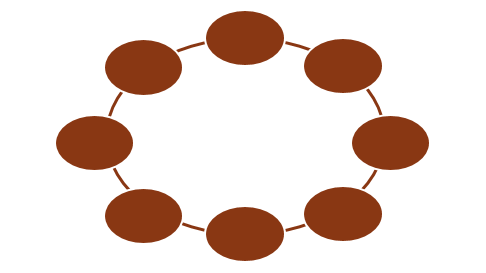 The “Collaborative vision building” method can integrate a link to iKnow platform (outcome of FP7 project on foresight http://wiwe.iknowfutures.eu/iknow-description/), which aims at interconnecting knowledge on issues and developments potentially shaking or shaping the future of science, technology and innovation (STI) in Europe and the world. The iKnow platform is particularly useful at addressing issues that have often remained of the policy radar and, so far, have received little attention in forward-looking activities: the identification and analysis of Wild Cards and Weak Signals (WI-WE) and their effects on European and global science, technology and innovation (STI) policy. Wild Cards are the kind of issues that can potentially shape our future. Weak Signals relate to issues that are currently shaping it. iKnow has used Foresight and Horizon Scanning (FHS) approaches to support the research and technology development (RTD) agenda associated with each objective. A civic and societal capability. Data is collected primarily through stakeholder interviews and working groups / focus groups. Iwaniec and Wiek (2014) have adopted a six-phase implementation roadmap for collaborative visioning (Figure 1) which has been used to support of the City of Phoenix’s General Plan Update. This approach is based on the SPARC methodology (Iwaniec et al., 2013). As suggested by the iWork experience, ICT-enabled solutions can effectively support and facilitate the implementation of this roadmap. 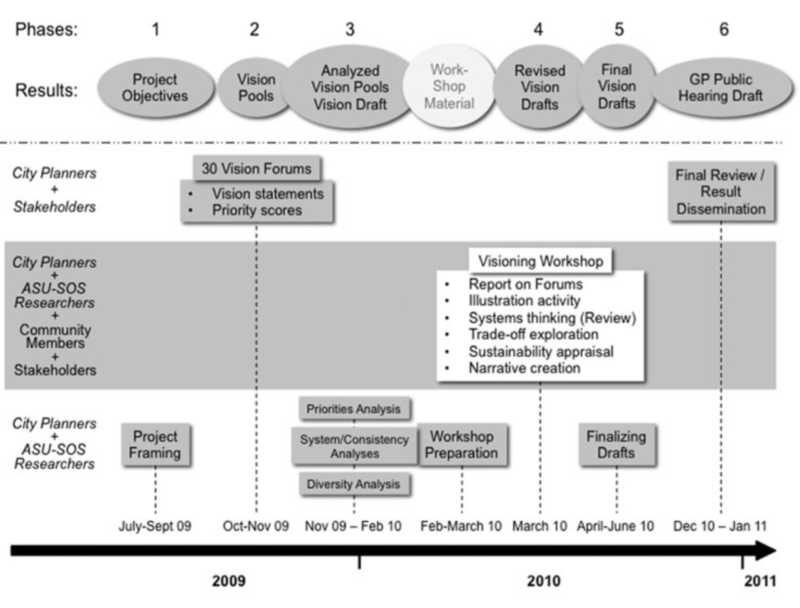 The first phase makes it possible to orient and frame the visioning process. “Framing aspects [includes] process function, domains of interest, temporal scope, spatial boundaries, visioning methodology and participatory design. The main framing [take places] at the beginning, but some framing aspects [can be] reconsidered and revised at later stages”. Moreover, the framing depends on legislative requirements and the and domains of interest. As suggested by the SPARC methodology, during this phase, public participation should not be considered. Only governmental representatives of the region subjected to the visioning process need to work at this stage (Iwaniec and Wiek, 2014). Participatory meetings are organized and conducted “to elicit and organize vision statements from community members”. In the case of Phoenix, for example: “over 750 […] individuals participated in […] 30 Forums (13 – 40 participants/Forum) [which] were public events”. The meetings should be designed “to introduce the visioning process, and elicit vision statements as well as priority scores from the participants. After an initial discussion based on the guiding questions […], the core visioning activity” need to focus the attention on how participants image the region in a distant future. Participants are therefore asked to provide “future-oriented, value-based statements […]. The vision statements [are] then prioritized in a voting activity”. Moreover, as suggested in the SPACR methodology, participants need “to provide overall narratives based on their individual vision statements”. The finals result should be a list of prioritized vision statements organized by application domain (Iwaniec and Wiek, 2014). During the third phase, the vision statements are “deconstructed and standardized”. Looking at the Phoenix example, standardization means: “for example, the vision statement ‘abundance of drought tolerant trees for shade’ was assigned the standardized elements: vegetation, xeric, trees, landscaping, water management, shade. Standardized value propositions or ‘normative qualifiers’ (e.g., abundant, affordable, diverse, responsible, strong, superior) were assigned to each element”. Therefore, “a vision element is composed [by] a standardized element and associated value propositions. Descriptive codes [can be] utilized to specify actors’ role, impact, location and spatial scale […] Results [need to be] visualized and formulated with the public engagement of the subsequent phase in mind”. The result of this phase is an initial narrative for the vision (Iwaniec and Wiek, 2014). A Visioning Workshop is organized to discuss the results achieved during the Vision Forums and collectively revise the draft of the vision. All participants of the Forums are invited to the workshop, however, additional recruitment should be conducted. The workshop starts with a plenary session during which the outcomes of the Vision Forums are discussed and the preliminary city vision is presented. Participants are then divided into small groups coordinated by one or more facilitators. The groups are requested to discuss the draft or specific part of it. The workshop ends with a plenary session with a final discussion of the groups’ work. “Feedback forms [are] collected from the participants”. The main output of this phase is the final narrations of the vision (Iwaniec and Wiek, 2014). After the Visioning Workshop, a report with the vision is produced (Iwaniec and Wiek, 2014) by the governmental authority. The final vision is approved and presented publicly (Iwaniec and Wiek, 2014). Iwaniec, D., Wiek, A., & Kay, B. (2013) SPARC – A Criteria-based Approach to Visioning in Transformational Sustainability Research (Tempe: Sustainability Transition and Intervention Research Lab, School of Sustainability, Arizona State University). John, B., Withycombe Keeler, L., Wiek, A. and Lang, D. J. (2015) How much sustainability substance is in urban visions? An analysis of visioning projects in urban planning, Cities, 48, 86-98. Susskind, L., McKearnan, S., & Thomas-Larmer, J. (1999) The Consensus Building Handbook: A Comprehensive Guide to Reaching Agreement (Thousand Oaks, CA: Sage). van de Kerkhof, M. (2006) Making a difference: On the constraints of consensus building and the relevance of deliberation in stakeholder dialogues, Policy Sciences, 39, pp. 279–299.